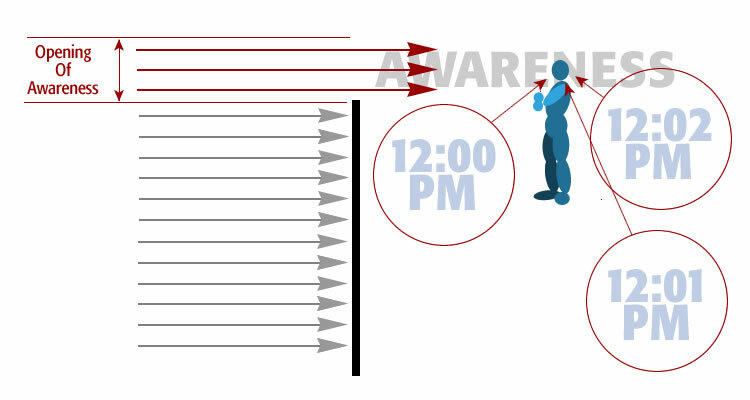 The illustration shows three conversations getting through to awareness instead of just one. Three simultaneous conversations are shown on the left as arrows in red. Normally only one conversation gets through. Now we listen to three. Theoretically we are actually listening to three conversations at once as shown by the figures on the right. 1. Any jumping back and forth between conversations can be eliminated. Shifting focus his time. We are talking about listening to three conversations at once. 2. Each conversation would be attracting our conscious awareness with the same ferocity and focus. Rather than listening to one and hearing three, we are talking about listening to all three simultaneously. 3. If asked to take test afterward, on the subject matter of each conversation, we would know the subject matter of all three. Listening to three conversations at once would lead chaos and confusion. It would feel as though three different people were shouting at you each demanding your undivided attention. In the example above we theoretically opened awareness from one conversation to three. As a result we were plunged into chaos and confusion. Opening awareness even this tiny amount resulted in a drowning of sensory input. Undaunted however, we are going to open awareness still further. 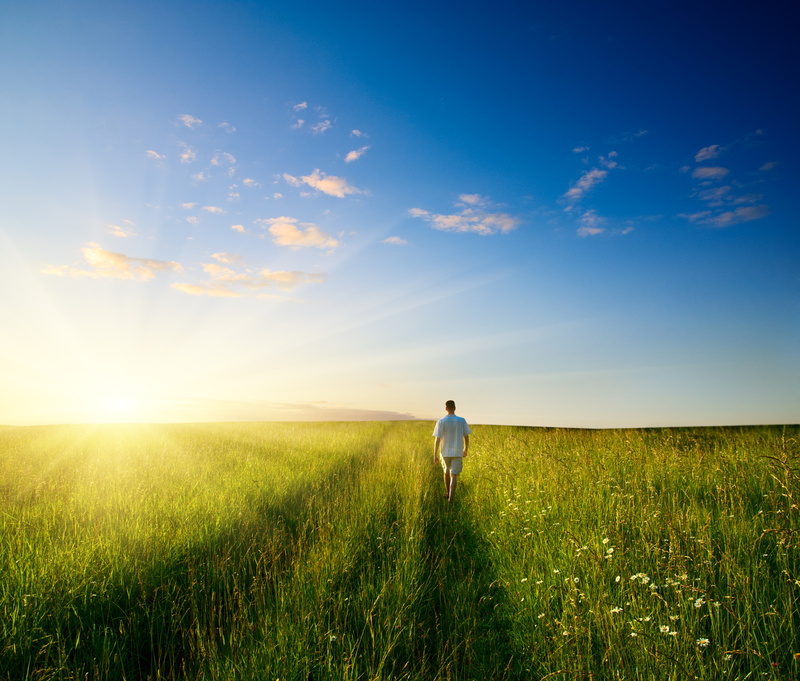 We are now going to be consciously aware of even more of the environment. Imagine opening awareness from three conversations to six. Now we have six arrows in red coming at us. Imagine opening awareness still further. Imagine being able to actively listen to (and fully understand) every conversion in the room all at once. Imagine how confusing that would be. Continuing this trend, imagine opening awareness up still further and pushing it to its upper limit. We are going to throw open the doors of awareness and let everything in. Basically you’d have conscious awareness extended out to the walls. Everything we have done with awareness so far has been within one moment in time. Now we are going to look at awareness with respect to time. 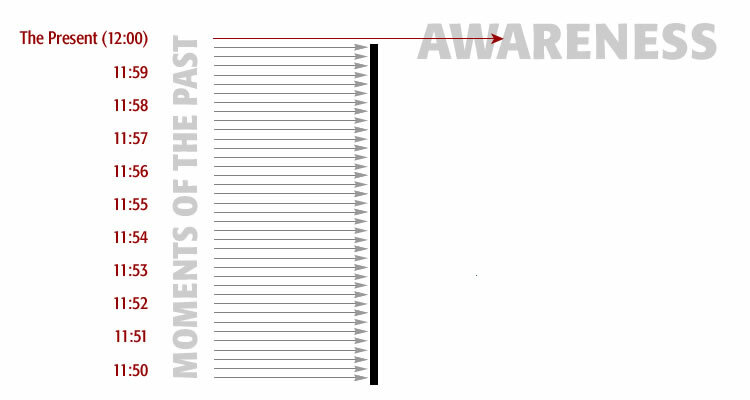 The illustration above shows awareness with respect to time. Notice how we are aware of just one moment. The other moments are in the past. Awareness operates in time exactly like it operates in space. 1. In time we are aware of just the present moment. It is our focal point. All other time is in the background. 2. In space we are aware of one conversation. It is our focal point. All other conversations and sensory stimuli is in the background. Awareness is focused in the present moment. The present is our point of view with respect to time. 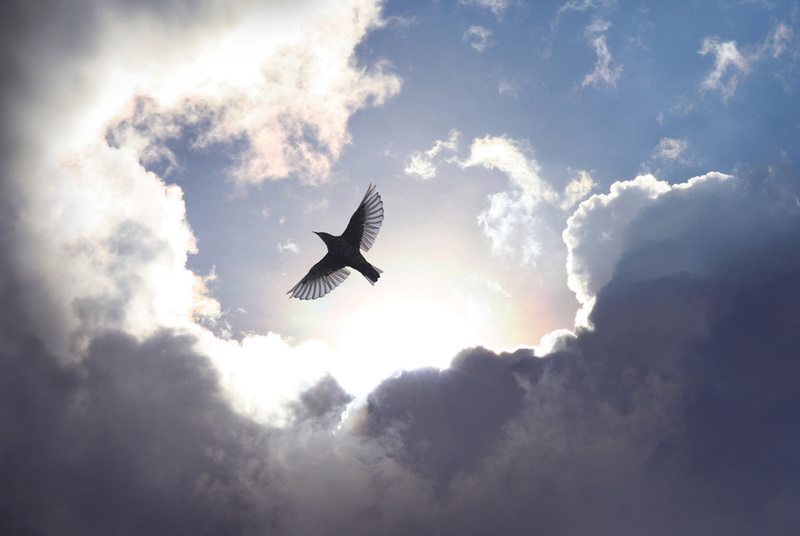 Awareness is focused on one thing within the environment. That is our point of view with respect to space. What would it be like to experience (be aware of) three moments in time simultaneously? 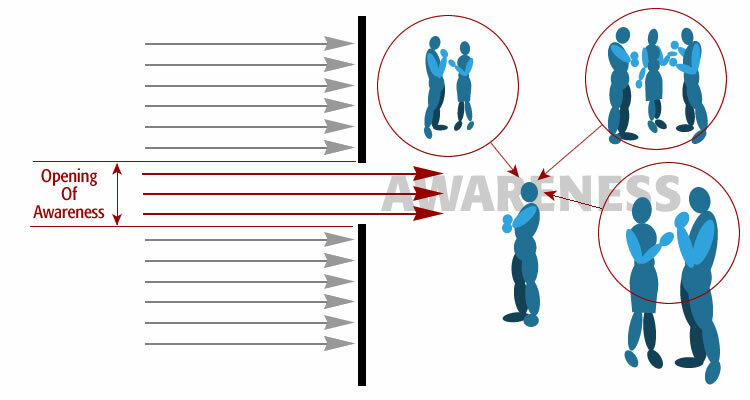 This illustration shows how confusing it would be to be experiencing in five moments at once. 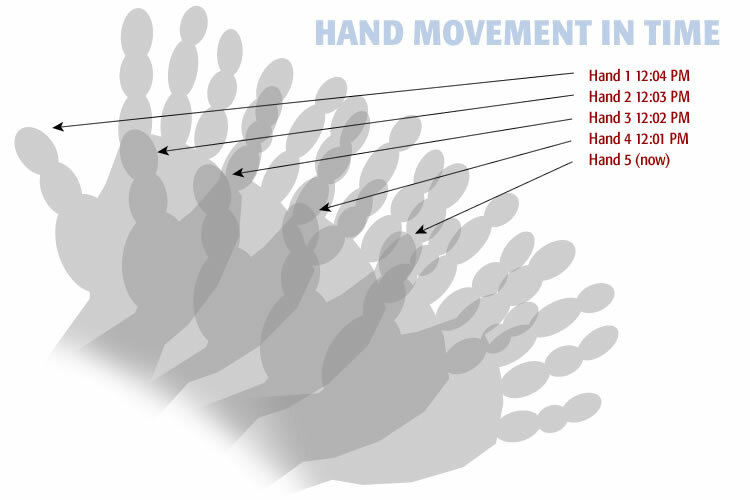 When you move your hand, you wouldn’t see one hand, you would see five hands, all real as shown above. Experiencing five moments the single hand would be fanned out in a matrix of five hands. You could not know which of the five hands was the “real” hand. They are all real. How could you hold onto anything? It would not be just the hand that has this difficultly. It would be the entire environment. Experiencing more than one moment (at a time) would plunge our mind into utter chaos. Every moment demanding your full attention would be chaos. Incidentally this confusion is exactly the same confusion resulting from awareness of multiple conversations. When awareness opens things become complicated. Without our singularity of focus, in both time and space, things would be hopelessly complicated. Singularity of focus keeps realities from being superimposed on each other. Without singular focus we would drown in confusion.